You are currently browsing the tag archive for the ‘Wales’ tag. “I was thinking of very old times, when the Romans first came here, nineteen hundred years ago — the other day. . . . Light came out of this river since — you say the Knights? Yes; but it is like a running blaze on a plain, like a flash of lightning in the clouds. We live in the flicker — may it last as long as the old earth keeps rolling! But darkness was here yesterday. Imagine the feelings of a commander of a fine — what d’ye call ’em? — trireme in the Mediterranean, ordered suddenly to the north… Imagine him here — the very end of the world, a sea the colour of lead, a sky the colour of smoke, a kind of ship about as rigid as a concertina — and going up this river with stores, or orders, or what you like. Sand-banks, marshes, forests, savages, — precious little to eat fit for a civilized man, nothing but Thames water to drink. No Falernian wine here, no going ashore. Here and there a military camp lost in a wilderness, like a needle in a bundle of hay — cold, fog, tempests, disease, exile, and death — death skulking in the air, in the water, in the bush. They must have been dying like flies here. Oh, yes — he did it. Did it very well, too, no doubt, and without thinking much about it either, except afterwards to brag of what he had gone through in his time, perhaps. They were men enough to face the darkness. And perhaps he was cheered by keeping his eye on a chance of promotion to the fleet at Ravenna by and by, if he had good friends in Rome and survived the awful climate. It was as dark as the Dark Ages got, then, in Britain. Classical civilization, what was left of it, hugged the shores of the Mediterranean during the Indian Summer of Theodoric’s Ostrogothic kingdom. Like the blood in the arteries of a severely wounded accident victim, it refused to circulate to the extremities. It was at this time, a century or so after the departure of the legions and a century yet before the arrival of the Roman mission, that a holy man was born. He had the sad misfortune to be born in a very hardscrabble time, in a very hardscrabble place. People didn’t have much time or inclination to record their doings, indeed, it would be hard to imagine that the people who lived at this time would have thought their struggle for survival worthy of recording. So what survived were stories, stories vivid enough to be remembered. Stories such as the one about the wandering Briton princeling who was travelling far from home when he came upon a maiden bathing in a stream and was overcome by lust. He forced himself on her, and she conceived. It was a brutal age, and it appears the leaven of the Gospel had little power to soften men’s passions among these jettisoned folk, and none among the pagan Saxons already coursing far inland. She carried the child for nine months, refusing on one occasion to allow a local ruler to terminate her pregnancy. She gave birth in a women’s monastery, and her child was raised there. This child, grown to be a man, began to preach the gospel in his corner of the world. The reputation of his sanctity spread, and he began to become known as y Sant, or simply, the saint. It is unusual that the saint would come to be called the Illuminator of Wales, as his country was not known by that name at that time. Most likely, his country was still known by her Roman name: Britannia, and her people spoke Latin after their fashion as well as their native British, now Welsh. Like a formerly prosperous family fallen on hard times, they must have cherished these small remnants of Roman civilization, and maybe, just maybe, Christianity was one of these remnants. It is by no means certain that the saint’s countrymen were all Christian. It had been the legal religion of the Empire for only a scant 20 years before the legions departed, and there were many pagans for the saint to convert. The full flower of his manhood is punctuated with many stories. The saint was preaching to a crowd of people, and the crowd grew to such a proportion that those on the fringes were unable to hear his preaching. He prayed, and the earth rose under his feet, forming a hillock so that all could hear his words. Some farmers nearby were complaining that there wasn’t enough water for their crops, so he prayed, pushed his staff into the ground, and a fountain of water sprayed up to provide the farmers what they needed. The monks at this time must have been quite lax, although it is remarkable that there were any monks at all. Brittania was the other side of the world from Christian monasticism’s center of gravity in Egypt and Palestine, but monks there were, and many followed the saint. He founded many monasteries and guided his monks with a rigorous discipline. They were forbidden the use of draught animals, and had to pull their plows themselves. In addition, they were enjoined to forswear beer and wine, and drink only water, a real test of faith in a day before chlorine tablets. Be steadfast, brothers, and do the little things. 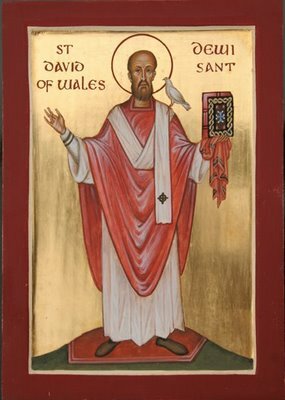 This is Dewi Sant, Saint David, patron of Wales in the undivided Church. Interestingly, Orthodox, Catholic, and Anglican all honor him, and his last church is now a great cathedral. The Welsh still love him, and his day is their national day. He is also my patron, and I would like to share a story of a miracle I believe was wrought by his intercession. When my family and I moved to Atlanta late in 2007, the area been suffering a severe drought for many years. The drought was so absolute that people were not allowed to wash their cars or water their lawns. I hadn’t been Orthodox longer than a few months, but I noticed that St. David had worked many miracles that were related to water. I besought his intercession on our behalf and rested the matter with him. On his day, March 1, 2008, Atlanta experienced a freakish snowfall of several inches that effectively broke the drought. The commentator on the radio noted that this was the best way to drop so much precipitation on a drought-hardened ground. Five years later, even though water levels have yet to return to normal, at least the lawns are being watered and the cars washed.